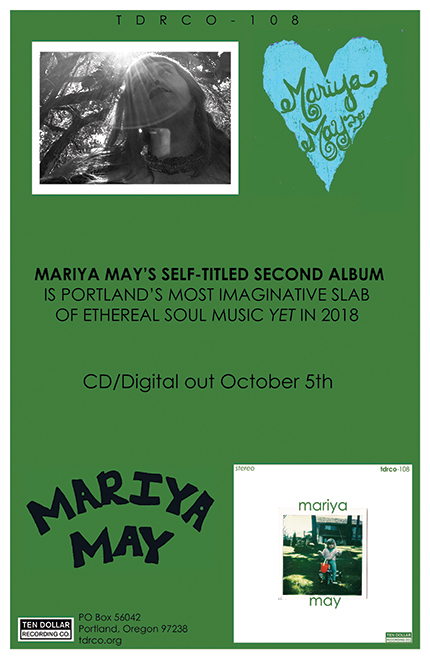 Mariya May - Music site at Portland label Ten Dollar Recording Co.
VIDEO: "The Way That I Do"
Mariya May’s album Call Me Back if You Can Dig the Music finds the soulful, Portland-based songstress helming a deft concoction of lush neo-soul, rafter-rattling dub reggae, and verdant folk-addled adages to love and loss, all shot through with a keen pop sensibility and strident lo-fi attitude. Call Me Back if You Can Dig the Music manages to listen as both vintage and modern at once, familiar and yet fully in its own element. Backing up May’s vocal, flute, and piano duties herein is longtime co-collaborator Ryan Michael Block, who takes the reins on guitar, bass, and percussion, and Peter Qualtere-Burcher, whose soulful and omnipresent tenor sax pulls it all together and lends a smoky, jazzy air to a unique record that employs the added dynamic to great effect. Taken together with May’s haunting flute lines and strong vocal and songwriting presence, the total musical package comes off with an ease and timelessness that is a giddy, memorable listen and yet another great addition to the TDRCo catalogue. Segueing from May and Block’s previous work with What in Your Heart Can Put You in a Trance, May’s recent solo work is at its most soulful and infectious when borrowing from and building on themes established in the couple’s previous project(s), taking their earlier sultry, earthy dub-soul-pop-folk experiments and transposing them to a further level of refinement and easy cool. Add in a generous helping of some serious golden-era Motown throwback and the added competence that comes with years of collaborative effort, and you’ve got Call Me Back if You Can Dig the Music, which is perhaps May and Block’s most comprehensive and mature musical expression to date. May’s vocals are always a strong centerpiece in all her recordings, utilizing a delivery that’s part Hope Sandoval and part Amy Winehouse, a blending of breathy wispiness and soul-maven croon that floats and flitters through the album’s arrangements like confetti, at times demanding total attention and at others blending into the background like another instrument. Peter QB’s velveteen sax work on this outing offers a huge compliment to May’s vocal delivery, sliding beneath the vocal lines with ease and candor. Together with May’s lilting flute lines, the addition of the tenor sax adds a slinky and ethereal counterpoint to Block’s terra firma dub reggae drenched bass lines. With all these diverse influences taken in tandem and blended so seamlessly, the musicianship on Call Me Back if You Can Dig the Music could be compared to a dollop of classic Motor City soul gold with a Kingston twist, as if Hitsville studio rats had been shipped in to do session work at Studio One. The result is infectious and fun, and solid as hell. May’s lyrical themes often dwell long on scenes of love, attraction, loss, and places in-between, adding to the classic throwback vibe and lending a heart-sweet quality to the album’s overall feel. Songs like the swirly and melodic “Out Walking” (featuring TDRCo wunderkind Thomas Mudrick on back-up vocals), the Winehouse-esque “Like Birds in the Spring”, and the richly textured “Let it All Fall Free” offer up odes to that sweetest of sentiments, while others like the bass-driven reggae shuffle of “Open Up (It’s Cold)” deal reciprocally with the fallout of desire and faded love. Other tracks have a characteristically bubbly, carefree quality about them, such as the slightly country-battered jaunt of “Deep Into the Trees”, or else a gravity of their own, as with blue-eyed soul toe thumper and album standout “I Remember”. Filling out the song roster are the dubbed-out shimmer of “From a Loft We Looked Across” and the melancholic beauty of “Bells Ring”. Call Me Back if You Can Dig the Music is definitely not short on either vision or listenability, and many of the tracks here are well worth some repeat uptake into your earholes. Finally, Call Me Back if You Can Dig the Music pulls in a nicely diverse set of cover tunes to finish out the record, starting with a somber psych-soul rendition of The Delta 72’s “Just Another Let Down”, moving on to a Caribbean interpretation of the Mountain Goats’ “Orange Ball of Love” (with guest trumpet courtesy of TDRCo dub aficionado Prince Joely), and finishing out with the lingering sing-along chorus refrains of Trampled By Turtles’ “Repetition”. Call Me Back if You Can Dig the Music is another example of May’s grounded musical sensibilities and dynamic range, and an excellent addition to her steadily growing catalogue of work. Highly recommended. 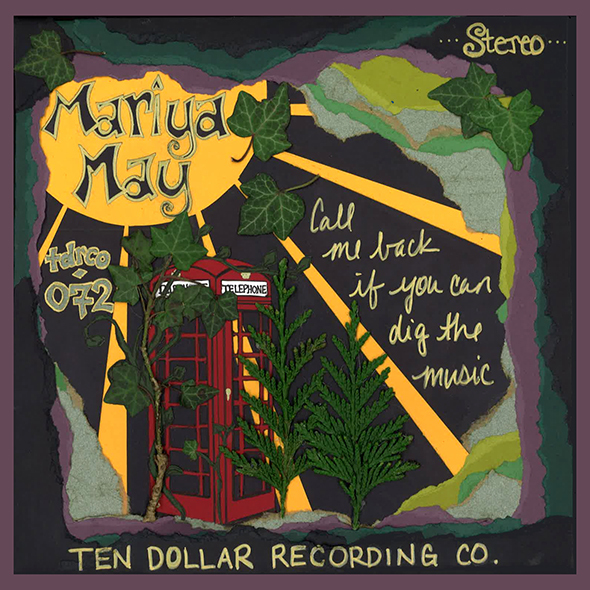 Mariya May’s Call Me Back if You Can Dig the Music is out in May 2016 on Portland’s effervescent Ten Dollar Recording Company label.